My 2017 had the same issue. I took it to the dealer and they replaced the throttle pedal assembly. Smooth as silk now. My 2018 truck never had the issue. Hi all; I'm having issues with my 2004 GMC Canyon signal lights. When I press the brake pedal the left turn signal indicator on the dash lights up. When I select left turn signal all the indicator lights on the truck flash like they would if I turned on the hazards. Right signal works ok. All bulbs are good. I'm thinking body control module? Anybody else ever have this problem? Any help is greatly appreciated. Thanks. I have two 2018 crew cab trucks. One has the 5.3 6 speed the other has the 6.2 8 speed. Throttle pedals are total different when you hit the detent. The 5.3 is a lot smoother and it feels like the 6.2 throttle is going to stick. It never has but I'm concerned enough about it that I'll have the dealer look at it next time I'm in for service. I have the 5.3 in my work truck and the 6.2 in my personal truck. I get better gas mileage with the 6.2l. And the grin factor is amazing! Check number 1 and 7 plugs. I bet they are oil fouled. 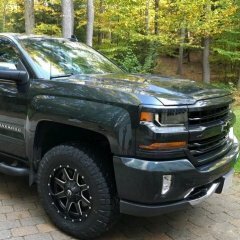 I have a 2017 silverado crew cab ltz with the 6.2/8 speed and have not noticed any issue like you describe. But I did have the dealer change the transmission filter and flush the fluid due to a shudder at highway speed when it was very new and less than 2000km. It is cured now. Maybe that service has also helped the issue you describe? Gotta love that 6.2! Hi; Thanks for the reply but I wish it would be that easy. No torsion bars on this truck. Hi; I have a stock 2007 Silverado NBS that came with 265/65-18 tires which are 31.6" in diameter and I am looking at replacing them with a 265/70-18 which are 32.6" tall. I do not have a levelling kit in the truck. Does anybody know if these tires will rub? Thanks. Hi; I had one mirror like this. The wire had corroded off of the back of the mirror. I was able to solder it back on. 2009 Silverado Door Seal Rusting? Hi; Thanks for the replies. I called the dealer and they said they haven't seen this problem on the '09s but has seen it on some others. I have to take it to them so they can look at it. Thanks. Hi; The lower part of the drivers side door seal on my new truck is full of rust. There is a metal insert in the seal that holds it together and it's completely rusted awayand now the seal is sagging. The passenger side is ok. This is the first winter for this truck and there is appox. 13000km on it. I really hope the rest of the truck won't rust like this. Anyone else have this problem??? Thanks.